My name is Vivien Honeyborne-Martins and I am a Cambridge graduate who taught sciences and maths for a while before finding my true calling in Podiatry. As a fully qualified graduate chiropodist and podiatrist, I am able to provide you with some of the best foot care in Cambridgeshire in my podiatry practice, Stepwise Footcare. I provide a wide range of podiatry treatments ranging from everyday chiropody, biomechanical assessment and orthotic therapy to a new and highly specialised Lunula Laser treatment for fungal nail infections. I am a Member of the Society of Chiropodists and Podiatrists and am registered as a podiatrist with the Health & Care Professions Council (HCPC) giving you peace of mind you are getting the best treatment possible in your local area. Having previously been a teacher of physics and maths, and having been a marathon runner myself, I have an exceptional and personal knowledge and insight into the biomechanical functioning of foot, ankle and leg. This makes me one of the leading practioners in the treatment of biomechanical problems, certain sports injuries and children’s foot and gait problems in the Cambridge area. Clients also travel to my practice from much further afield, including King’s Lynn and Thetford in Norfolk; Royston in Hertfordshire, Saffron Walden in Essex and Haverhill and Bury St Edmunds in Suffolk and even from Italy! General foot care is available to all who cannot manage their own feet for any reason. I’m available five or six days a week including Saturday mornings. Call for an appointment on 01638 741973. Your call will be forwarded to my remote reception from 08.30hrs to 18.00hrs on weekdays and they can make appointments and answer queries. Here is a pic of Ollie in action, the new insoles are fine now, he seems to have hit another level of ability and fitness, thanks so much for your help over the last year. A year ago he could barely run and was in constant pain. 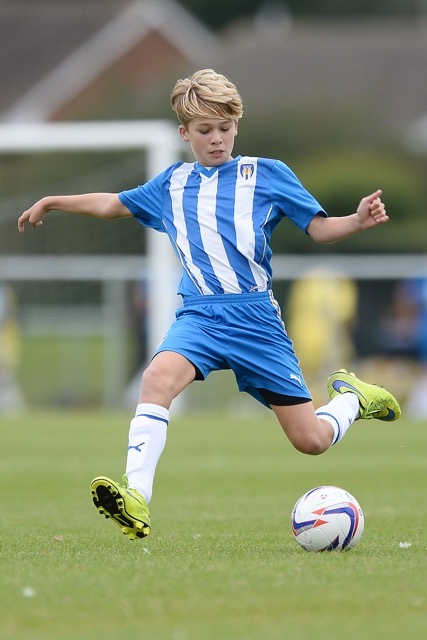 Without the orthotics he wouldn’t be playing now let alone playing Academy level football 4 times a week. He bounces back from injury so much quicker now and never has pain in his feet / ankles like he used to. "I first started seeing Vivien in 2009. I only wish I had met her before. Vivien had in-depth knowledge of the problems I was experiencing and easily explained everything I needed to know. She is always polite, helpful and efficient. With her deep knowledge of the workings of the foot she was also able to guide me with using insoles which have helped me tremendously. I would thoroughly recommend Vivien to everyone." I have been a customer of Vivien Honeyborne-Martins of Stepwise Foot Care for a number of years. I would highly recommend any one who has walking problems due to there feet not being quite in line do use the Footheath UK scanner and get some in soles made.